Net neutrality. Don’t roll your eyes, this is IMPORTANT. President Obama has weighed in on it. The FCC finally passed new rules for it. Senators and congressmen continue to debate it. Comcast hates it. Netflix is all for it. But what IS it? Since it was first announced, the FCC’s plan has been met with widespread criticism and has dragged the issue of Net neutrality, or the idea of an open Internet, to a mainstream audience once again. Over the past few weeks (or years), you’ve probably heard a lot about this issue. If you’re not sure what it really means, don’t feel too bad. It’s a topic that inspires debate so intense that some of the simplest details have been obscured and whitewashed. We’re here to catch you up on everything you need to know. Updated on 03-12-2015 by Malarie Gokey: Added news the FCC has made the full text laying out the new Net neutrality rules public. Go straight to the 2015 Net Neutrality Timeline for all the information. What exactly does Net neutrality mean? To get a basic definition, we turn to Columbia University law professor Tim Wu, who is credited with coining the term. “Network neutrality is best defined as a network design principle. The idea is that a maximally useful public information network aspires to treat all content, sites, and platforms equally. This allows the network to carry every form of information and support every kind of application. The principle suggests that information networks are often more valuable when they are less specialized — when they are a platform for multiple uses, present and future,” Wu wrote on his website. During 2014 in particular, as politicians have become involved, the issue is thornier than ever. Here’s a timeline of the Net neutrality debate; we start and end with the current crisis, but also reach all the way back to the roots of the issue in 1996. The FCC has gotten a lot of flack for not revealing the full text of the new Net neutrality rules immediately, but now the agency has published the rules for all to see. The document clears up many burning questions about which parts of Title II will apply to broadband Internet, among other things. Apparently, the FCC will use very few of the rules from Title II, as around 700 of them have been declared inapplicable. “This includes no unbundling of last-mile facilities, no tariffing, no rate regulation, and no cost accounting rules, which results in a carefully tailored application of only those Title II provisions found to directly further the public interest in an open Internet and more, better, and open broadband,” the document reads. The rules also emphasize that a “light touch” will be used, and the FCC will not meddle unless the openness of the Internet is clearly endangered. We will provide a full breakdown of the text soon, but for now, you can read the entire document on the FCC’s website. The FCC finally passed chairman Tom Wheeler’s proposal to reclassify broadband under Title II and other Net neutrality rules in a 3-2 vote. Both of the agencies’ Democratic Commissioners Jessica Rosenworcel and Mignon Clyburn voted with Wheeler to pass the rules. While the chairman and supporters of an open Internet celebrated the ruling, the two Republican Commissioners notably opposed the idea, citing concerns for free market competition and over regulation. Commissioner Ajit Pai even accused the FCC of making an “about-face” on the issue just because President Obama told it to do so. For more coverage on the ruling and what it means for you, ISPs, and mobile carriers, check out our companion piece. Just days after it was reported that the FCC would finally propose a new solution to the Net neutrality debate, FCC Chairman Tom Wheeler wrote an op-ed piece on Wired declaring that he has issued a proposal that would reclassify broadband under Title II, so the FCC can ensure that the Internet stays free and open to all, regardless of how deep their pockets are. In the piece, Wheeler explained why he believes an open and free Internet is essential to future innovations with a very personal story. The FCC chairman revealed that back in the early days of the Internet, his startup company perished, while its competitor, AOL thrived — all because of the open nature of the Internet. Wheeler added that had the Internet been more closed off, a startup like AOL would never have existed, let alone survived. In the end, the chairman concluded that strong rules are needed to keep the Internet open to innovators big and small. FCC Chairman Tom Wheeler is expected to reclassify broadband under Title II sometime this week, reports the New York Times. Wheeler’s proposal will most likely declare high-speed Internet a telecommunications service instead of an information service, but will not reclassify the service as a utility in the strictest sense of the term. For example, the FCC will not interfere in pricing or interfere with Internet Service Providers’ decisions too heavily. The proposal is, however, expected to forbid Internet fast lanes, paid prioritization, and other violations of the Net neutrality concept. Wheeler may also include wireless data services in the new rules, so as to ensure that no content is blocked along those channels either. Regardless of the level of strictness the FCC proposes, ISPs and other anti-Net neutrality companies will likely appeal the decision. Republican chairmen of the Senate and House commerce committees, John Thune and Fred Upton, issued a bill that would include some of the Net neutrality proposals the White House and FCC has put forth, while stripping the FCC of all decision-making authority. The bill would forbid the blocking or throttling of specific websites, except under special circumstances, including “emergency communications or law enforcement, public safety, or national security authorities.” In other words, the government and or private corporations would be able to justify paid prioritization of websites upon occasion. The bill does not, however, reclassify Internet as a utility, or adopt the most progress recommendations set forth by legislators, tech companies, and the FCC alike. In addition, the bill would remove the FCC from the decision-making process entirely, and the agency would simply act as a law enforcer, subject to Congress’ and the Senate’s authority. The FCC would also be unable to cite authority from Section 706 for new Net neutrality rules, including most of the ones Wheeler has proposed, the most important of which is reclassification of broadband as a utility. The Republicans are seeking the support of Democrats for the bill, so as to preempt the FCC’s decision and prevent the reclassification of broadband under Title II. However, President Obama is opposed to such a bill, and the White House stated that legislative action is unnecessary and the decision should lay in the FCC’s hands. Meanwhile, the FCC agreed that Chairman Tom Wheeler needs to act fast, if he doesn’t want to see the House and Senate act before his agency does. In a letter to the FCC, Sprint stated that it will support the FCC’s decision on Net neutrality, even if the organization reclassifies Internet as a utility under Title II. “So long as the FCC continues to allow wireless carriers to manage our networks and differentiate our products, Sprint will continue to invest in data networks regardless of whether they are regulated by Title II, Section 706, or some other light touch regulatory regime,” the carrier wrote. Sprint is the first carrier to declare support for the controversial proposal. AT&T and Verizon have openly threatened the FCC with a lawsuit, if broadband is reclassified. During the 2015 Consumer Electronics Show (CES) in Las Vegas, CEA President Gary Shapiro sat down with FCC Chairman Tom Wheeler to chat about Net neutrality. For the first time, Wheeler hinted the FCC will propose Title II reclassification of Internet as a utility. Although he discussed many of the benefits of Title II reclassification, Wheeler also stated that paid prioritization still makes sense in some cases. He also denied rumors that he and the president are at odds over Net neutrality. Wheeler did not discuss any of the specifics for his plan for the future of the Internet, he did set a date for the vote. “We’re going to circulate it to the commissioners on February 5th and vote on it February 26th,” Wheeler announced. Recently, the concept of treating Internet content equally has been challenged. This erupted in April when the Federal Communications Commission (FCC) issued a proposal that would let broadband companies provide Internet “fast lanes” for large corporations that can afford to pay a higher fee. This meant smaller companies that cannot afford preferential treatment in terms of content delivery speeds would have to compete at a disadvantage. Most of the blame has been directed at FCC Chairman Tom Wheeler, a former cable and telecoms lobbyist. Most of the blame has been directed at FCC Chairman Tom Wheeler, a former cable and telecoms lobbyist with ties to the companies that would benefit most from his proposals. The negative response has created cracks in his leadership and the FCC’s commitment to the draft. In early May, two FCC commissioners called for a delay on the May 15 vote for the proposed rules, but Wheeler rejected the suggestions. A spokesperson for the FCC said that Wheeler believed that the process would allow people to see the proposal. Wheeler has started to shown signs of softening his stance, although his concessions will likely prove insufficient. According to the Wall Street Journal, he offered assurances that broadband companies would not be allowed to divide Internet traffic into fast and slow lanes. He also revived the possibility of classifying ISPs (Internet Service Providers) as public utilities. The FCC may change its mind a lot nowadays, but reclassification is starting to look more likely. In a live chat session on Twitter, FCC Senior Counsel for External Affairs Gigi Sohn said that the agency is seeking input on whether to use Title II of the Communications Act or Section 706 of the Telecommunications Act to enforce Net neutrality. The FCC can use Title II of the Communications Act to regulate broadband providers under “common carrier” rules. Section 706, on the other hand, would give the FCC the power to regulate ISPs on a case-by-case basis. Republicans were opposed to turning the ISPs into common carriers. The FCC’s new proposal says that it will have the power to grant ISPs the ability to give preferential (extra fast) treatment to interested companies wishing for faster delivery of their services. The danger with this is that it will essentially let Internet providers like Comcast double dip, and charge both customers for Internet, and also big companies like Netflix for access to those customers. In time, this could also lead to an Internet that is divided into companies that can afford to pay for fast data delivery, and companies that can’t. If such a world existed in the last 10 years, a startup like Netflix may not have been able to create its dominant service. YouTube could never have challenged services like Google Video either, as Sen. Al Franken has pointed out. FCC Chairman Tom Wheeler has indicated that he’s open to classifying ISPs as “common carriers,” which could force them to keep their networks neutral to all data, and open them up to competing services, resulting in more choices for Internet service. Naturally, ISPs don’t want to do this because it could mean less profit. The FCC opened up the issue of Net neutrality to comments on its website. Comedian John Oliver then went on a rant about the importance of preserving Net neutrality and encouraged Internet commenters to unite in criticism of the FCC and Internet fast lanes. As a result, millions of people commented on the FCC’s website, which crashed under the burden. The FCC later denied that Oliver’s rant caused the shut down. Democrats in the Senate move to prevent the FCC from creating Internet fast lanes. The bill fails in the Republican-controlled House of Representatives. In mid July, members of the Internet Association, including Google, Facebook, Twitter, Amazon, Yahoo, LinkedIn, Reddit, Yelp, Expedia, Airbnb, and others sent a document to the FCC regarding Net neutrality on the comments page. The tech heavyweights and other smaller members threw their support behind Net neutrality and urged the FCC to protect the open Internet. Just a few days after the Internet Association asked the FCC to support Net neutrality, Netflix issued a document explaining how Internet fast lanes have already damaged its business, deprived customers of reliable service, and increased the abusive power of ISPs. More than one million people sent comments to the FCC on its website and many more sent emails to the organization before the July 18 deadline. The vast majority of commenters support an open Internet and called upon the FCC to enforce Net neutrality. A few broad themes popped up in the comments, including the idea that ISPs are corrupt, the government doesn’t care, fast lanes will kill innovation, and above all, the FCC must protect the Internet. You can read some of the best comments in our article. President Barack Obama took a more assertive stance on the issue of Net neutrality, essentially saying that his administration does not support Internet fast lanes. The FCC announced that it will host a series of round table events in September and October to discuss the issue of Net neutrality. All of the events will be livestreamed. House Minority leader Nancy Pelosi wrote a letter to FCC Chairman Tom Wheeler, in which she stated that broadband should be reclassified under Title II of the Communications Act and treated as a utility. She added that she does not support Internet fast lanes. On the last day of public comments for the FCC’s net neutrality proposal, the commission announced that it has received 3 million comments. The last official comment count was 1.48 million. Now that the comment window has closed, the FCC will have to wade through all the comments, weigh its decision, and take action. It’s unknown how long it will take before the FCC passes judgement on the issue of net neutrality, as no deadline is set. The FCC also held its first round table event to discuss the subject of net neutrality around 2:30 p.m. EST. Those interested can watch it live here and comment via emails addressed to roundtables@fcc.gov or tweets with the hashtag #FCCRoundtables. During a town hall meeting in Los Angeles on October 9, Obama again expressed his support for net neutrality and stated that he opposes the paid prioritization model, which would create Internet fast lanes. “On Net neutrality, I made a commitment very early on that I am unequivocally committed to net neutrality. I think … it’s what has unleashed the power of the Internet, and we don’t want to lose that or clog up the pipes,” Obama said. “I know one of the things that people are most concerned about is paid prioritization, the notion that somehow some folks can pay a little more money and get better service, more exclusive access to customers through the Internet,” he added. “That’s something I’m opposed [to]. I was opposed to it when I ran. I continue to be opposed to it now.” Obama continued, saying that while he can’t tell FCC chairman Tom Wheeler what to do, Wheeler knows his position. After months of quibbling over semantics, Obama officially declared his support for Net neutrality in a statement. He threw his support behind the proposal that would reclassify broadband as a utility and place its regulation under Title II. As such Internet Service Providers wouldn’t have any control over the speed, quality, or direction in which Internet connectivity flows. No blocking: If a consumer requests access to a website or service, and the content is legal, your ISP should not be permitted to block it. That way, every player — not just those commercially affiliated with an ISP — gets a fair shot at your business. No throttling: Nor should ISPs be able to intentionally slow down some content or speed up others — through a process often called “throttling” — based on the type of service or your ISP’s preferences. Increased transparency: The connection between consumers and ISPs — the so-called “last mile” — is not the only place some sites might get special treatment. So, I am also asking the FCC to make full use of the transparency authorities the court recently upheld, and if necessary to apply Net neutrality rules to points of interconnection between the ISP and the rest of the Internet. No paid prioritization: Simply put: No service should be stuck in a “slow lane” because it does not pay a fee. That kind of gatekeeping would undermine the level playing field essential to the Internet’s growth. So, as I have before, I am asking for an explicit ban on paid prioritization and any other restriction that has a similar effect. The president also referred to the outpouring of support for an open Internet from the American public as justification for his position on the issue. He did warn that he has no control over the FCC, and as such, his recommendations are mere suggestions. Still, presidential support for the reclassification of Internet as a utility may have an effect when combined with overwhelming demand from consumers. Shortly after, FCC chairman Tom Wheeler responded to Obama’s statement, calling it “an important and welcome addition to the record of the Open Internet proceeding.” He added that he and the President share similar views on Net neutrality and the FCC will consider Obama’s point of view. Wheeler mentioned his own proposal of a hybrid solution, too, but claimed the FCC needs more time to weigh its options due to legal concerns. Meanwhile, those who oppose Obama’s decision to support the reclassification of broadband came out in full force. Republican Senator Ted Cruz promptly compared Obama’s plan for the Internet to Obamacare. It’s worth noting that Cruz accepted money from Comcast — one of the ISPs that opposes reclassifying broadband — fairly recently. In contrast, consumer interest groups hailed Obama’s statement as a win for Net neutrality. “Today the Obama administration expanded its leadership to promote an open Internet by supporting the strongest tools to prevent blocking or throttling of Internet traffic, and by also supporting the strongest tools to deter fast lanes and prioritized traffic on the public’s most essential communications platform of the 21st century,” said Gene Kimmelman, president of Public Knowledge. The day after Obama’s declaration of full support for Net neutrality, FCC Chairman Wheeler met with executives from Google, Yahoo, Etsy, and others to again discuss the issue. According to four different people who attended the meeting and later spoke to the Washington Post, Wheeler appeared “visibly frustrated,” and said point blank that he can’t follow Obama’s recommendations to the letter, but will instead pursue a compromise. In the past Wheeler has proposed a hybrid approach to the issue and it seems that he still considers Internet fast lanes an option. Most advocates for an open Internet agree that Wheeler’s approach gives too much power to ISPs and could result in the unequal treatment of some websites. Although many big-name tech companies support Net neutrality and the proposal of reclassifying broadband as a utility, there are some other big players in the industry that don’t support the idea. Recently, 60 tech companies, including Intel, IBM, Qualcomm, Cisco, and many others signed a letter against the proposal put forth by open Internet advocates. The companies argue that investments in Internet technology will decrease dramatically if broadband is reclassified under Title II. The letter concludes with a veiled threat that if investments in the tech sector slow because the FCC reclassifies broadband, the U.S. could be headed toward another recession, or even depression. Although this may sound like fear mongering, the companies claim it’s a fact. Meanwhile, Netflix, Google, Facebook, and other tech companies who support Net neutrality seem to believe that the exact opposite is true. In the past, advocates of reclassification have stated that Internet fast lanes would stifle innovation and hurt investments in new companies. Net neutrality debates have experienced a revival over the past few weeks, but it’s actually an old issue, one that has existed since the formative years of the Web itself. In 2002, the FCC issued a ruling classifying ISPs as “information services.” This meant that broadband providers were no longer under FCC regulation. In 2014, the FCC-broadband providers shuffle has gone full circle. With Wheeler’s new proposed rules, he has raised the possibility of reclassifying ISPs as common carriers, perhaps as a way of making sure that smaller companies won’t be relegated to the Internet slow lane. The first documented case of a service provider discriminating against a certain type of Internet traffic came in January 2005, when North Carolina broadband company Madison River blocked the services of VoIP company Vonage. The clinical term for Madison River’s transgression is “port blocking.” In this case, Madison River was said to have blocked VoIP traffic to prevent phone subscribers from switching to VoIP. Another VoIP carrier, Nuvio, also reported port blocking from at least one broadband operator. In the end, Madison River was fined $15,000. It also signed a consent decree with the FCC that prohibited it from blocking VoIP for 30 months. Aside from Madison River, Vonage also said that it had identified other smaller broadband providers that blocked its services. Former Alaska Republican Ted Stevens is credited with bringing the topic of Net neutrality into politics. He did so in spite of not having even a basic knowledge of what the Internet is. During a 2006 Senate speech, Stevens described how “an Internet was sent by my staff” and arrived days later. The reason? “Because it got tangled up with all these things they’ve got going on the Internet commercially,” he said. 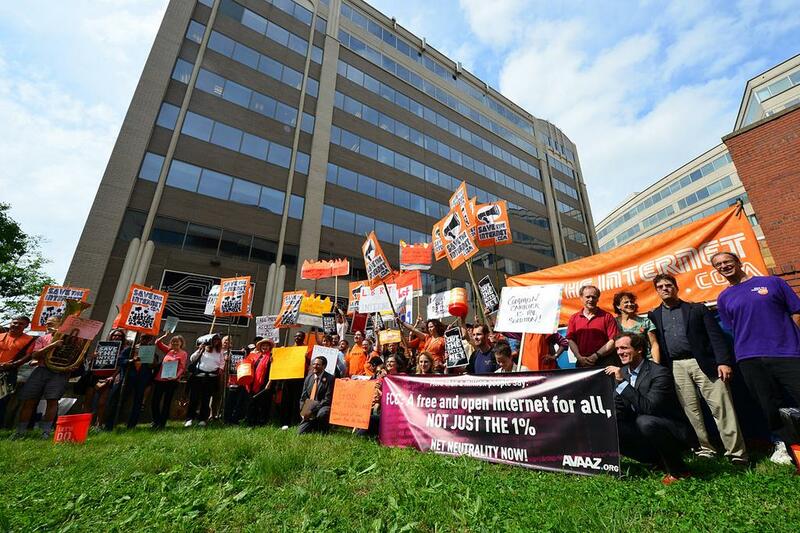 Protesters hold a rally in front of the FCC headquarters in Washington D.C. on May 15, 2014. During the same year, Congress introduced one of the first laws that aimed to preserve Net neutrality. The Internet Freedom and Non-Discrimination Act of 2006 was meant to overhaul the 1996 Telecommunications Act. The bill failed, it was approved by the House Judiciary Committee but was never taken up by Congress. To this day, the 1996 Telecommunications Act, is still the prevailing policy for regulating TV and wireless communications. A 2007 Associated Press report accused Comcast of blocking file sharing applications on its network. According to the Electronic Frontier Foundation, the broadband provider used TCP RST packets to interfere with connections. This method was said to be the same technique used by the Chinese government in censoring Web traffic. The next year, the FCC voted 3-2 to punish Comcast, marking the first time that the agency has asserted its authority in policing Internet traffic. The company wasn’t fined, but it was directed to stop blocking Web traffic and submit a plan for managing its network. The FCC’s punishment of Comcast set off a long legal battle. In 2009, Comcast sued the FCC, questioning its authority in regulating network neutrality. In April the following year, a court ruled in favor of Comcast, which weakened the FCC’s authority in regulating broadband providers. Later in the year, the FCC adopted new Net neutrality rules. The guidelines allowed broadband providers to regulate congestion over their connections, which critics warned could lead to usage-based pricing. Google and Verizon also put forward a “joint policy proposal” for Net neutrality. The agency’s legal battles continued on in FCC vs. Verizon. The FCC also lost that case, when an appeals court in Washington ruled that the the agency overreached in prohibiting providers from discriminating against some types of Internet traffic. The decision stuck down the agency’s Open Internet rules. Wheeler said that his agency will not challenge the ruling, and will instead propose a new set of rules. Which brings us to today. Where do YOU stand on this complex issue?